It’s getting pretty Halloweenish around here. The kids can’t wait until next weekend for trick-or-treating. Since Halloween is my favorite holiday, I’m a bit excited as well. Domino’s Pizza stopped by on Friday night. It has been years since Dominos crossed our lips…double pepperoni and extra cheese were the perfect combo. It was really good. I have a ginkgo tree in the yard. Ever since I took botany I have been fascinated with ginkgo trees. I believe this is either a Saratoga or a Ginkgo Biloba…not sure. If it’s a Saratoga the leaves are supposed to all fall off within three hours. I’m keeping a very close eye on it. I know you are all just dying to know. 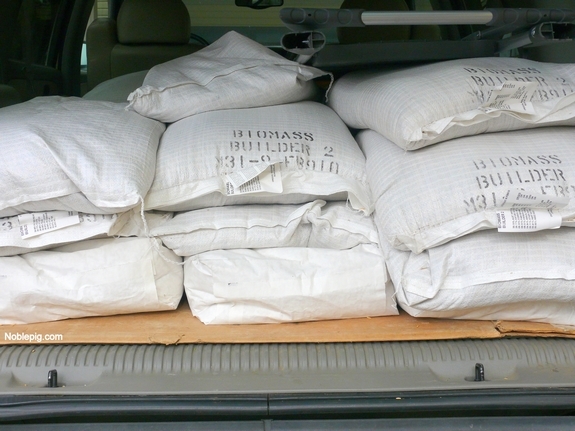 A thousand pounds of seed taken to the vineyard to plant the winter cover crop to slow erosion and put valuable nitrogen into the soil for grapevine planting in the Spring. 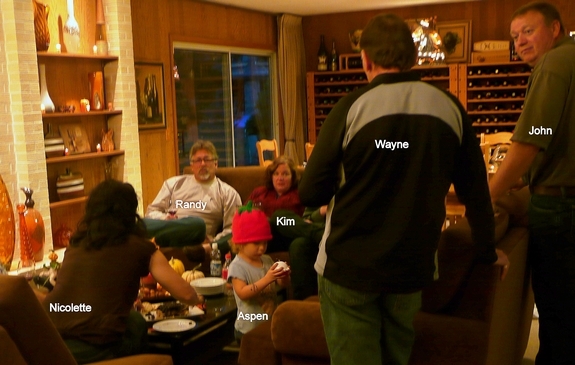 The funnest, nicest, kindest people to have as friends…the Bailey’s, the Coleman’s and the Wrigley’s…well this is some of them. Everyone else must be in another room. Babies love to party too. I love this kid. Signs of a good party. 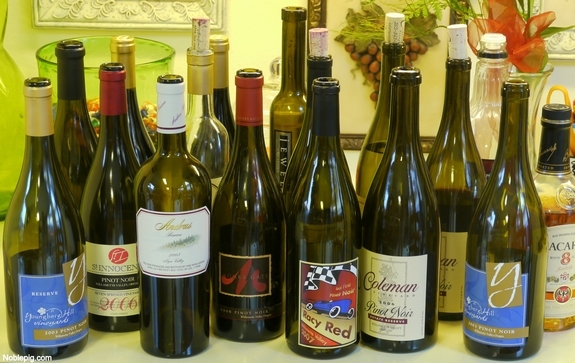 We had amazing wines from Coleman Vineyard, Youngberg Hill, Pine Ridge, Monks Gate, St. Innocent and dessert wine; Port from Jewel and Vin Santo from Carobbio. All fantastic! My obsession with squash and gourds continues. When I saw this butternut, I had to have it. My favorite tree right now…it’s my favorite color…orange! Spending time just enjoying the scenery…the best part of all. Curious what cover crop you’re planting? I tried hairy vetch once on a barren acre of our land…interesting, and it definitely did its part for enriching the soil. I also want to go to your dinner parties. Glad you had a great weekend! I worked. I am so in love with your atrium it’s not even funny. If I ever design my own home, it’s going to have an atrium. 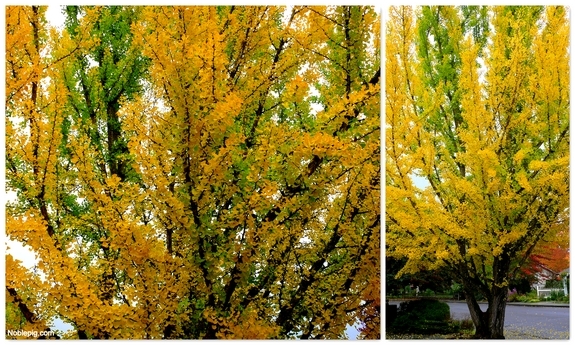 It seems like fall arrived over night – the trees around here just exploded! I went out this weekend looking for leaves to photograph. And if there’s a sudden leaf drop, I’d really like you to document that, preferably with a video. I didn’t know there was a tree that jsut dropped their leaves suddenly. Great weekend! Love seeing your trees with the colors, we don’t get much of that here in Florida so I enjoyed yours very much! looks like your favorite tree is a Japanese Maple? Love your pictures. The fall colors here in Ohio are stunning! You might want to head over to Pioneer Woman’s Home & Garden page and read the comments about wine labels. Apparently, there’s a huge contingent of people who buy wine solely based on the label! No pressure! My weekend was lovely, but not as nice as yours! Great photos and your party looked wonderful! Love the table setting. What a grand place to be during Halloween holidays. You have the perfect spot to entertain, decorate, and have already made so many good friends. Your atrium looks beautiful with the lighting. I hope the planting goes well now and in the spring. This is such an interesting story to follow! I know you are wishing time would fly by and get to the grapes….but the anticipation is a lot of fun for us. Thanks for the pictures. 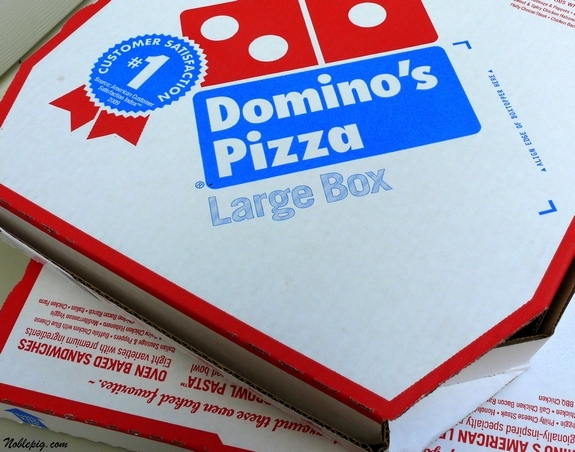 Just like your food photos make me ravenously hungry, the pizza box had a similar effect on me! You asked….our weekend was a lot better than the previous one we spent in the hospital. Our weather was beautiful and we just enjoyed being home on the bay. Monday is bringing lots of rain, though. Flash flood warnings are in effect until 7 p.m. for us. I love to watch it rain. My favorite was the pudgy baby feet! So cute! I love how wine families come together and bond. I have known many people in the wine business over the years and wine people are usually the most hospitable, nicest people on the planet. Enjoy your life, well it looks like you do. Looks like a great party! I was wondering if you were going to go whole hog with your Halloween decorations this year. looks like ya’ll are very much at home in the new house. Babies always make a party more fun. Well, not nearly as good as this! Love the glimpse into your life, Cathy. All the new friends, the little ones, so fun. I think of you at Halloween because I know it’s your favorite. You probably packed more Halloween boxes than anything else when you moved. Well, maybe more kitchen boxes. My weekend consisted of a surprise 50th birthday party for Sir Pickypants. We had it at a restaurant, but I think I wish you had catered it! What beautiful table settings. When I have 16 people over for dinner (something I’m putting a stop to because my home and my sanity can’t take it) it’s a big mishmash! You have some great Halloween decorations! 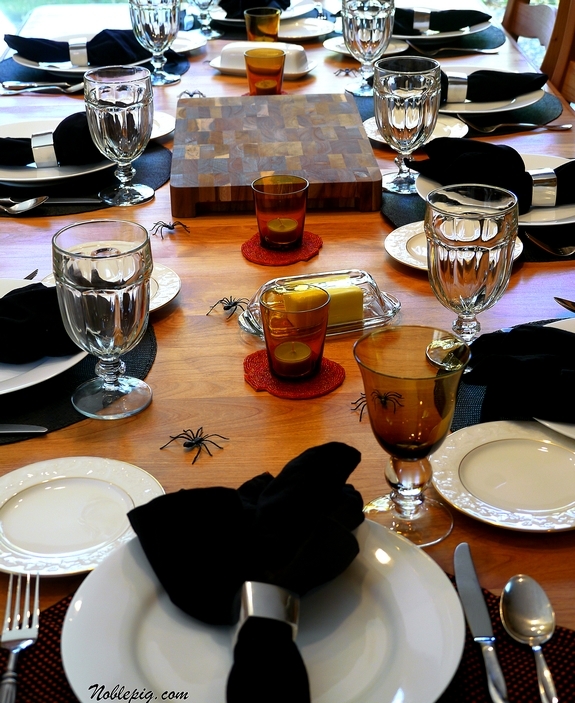 I love how you put spiders on the table, I’m going to do that at our party! Beautiful fall color outside your home too! Love the pics and especially love the kids table! I made your carmelized onion/blue cheese dip over the weekend and we had the leftovers on steak Saturday. It was tremendous! Other than cooking, we spent the weekend planting our container garden – seasons are rather weird in this man’s country. One thing’s for sure, jack o’lanterns don’t last worth a darn in this heat. I’m waiting till Thursday to carve. Your life is like a vacation…I want it. What nice pictures and a beautiful atrium! 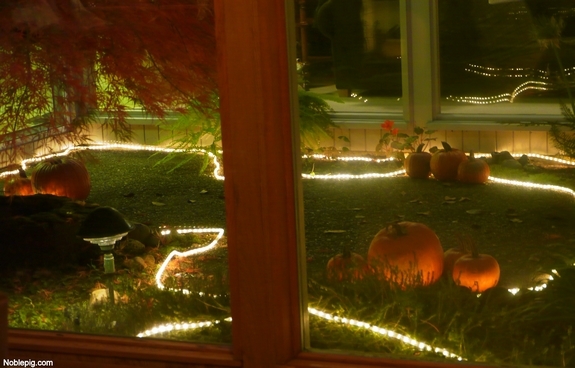 So festive with the lights and pumpkins. 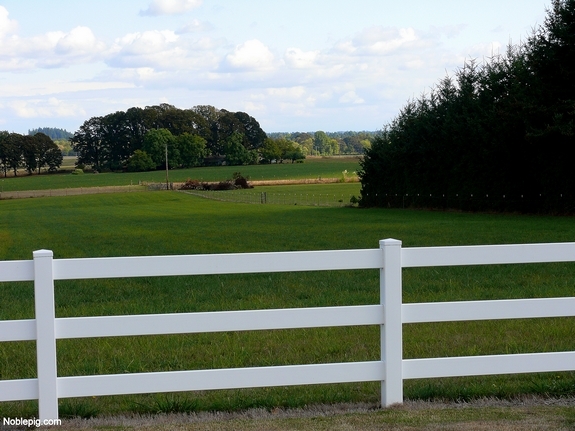 Love the view (must be your front yard)…just gorgeous! Love the warmth of your hospitality…can feel it through the screen…and that sneaky little rum bottle trying to weasel into the shot! Loving your wines there! And all the neat Halloween decorations! Beautiful party you threw – when there are that many dead soldiers, who gave up their lives for a good cause, one knows it WAS a good party! 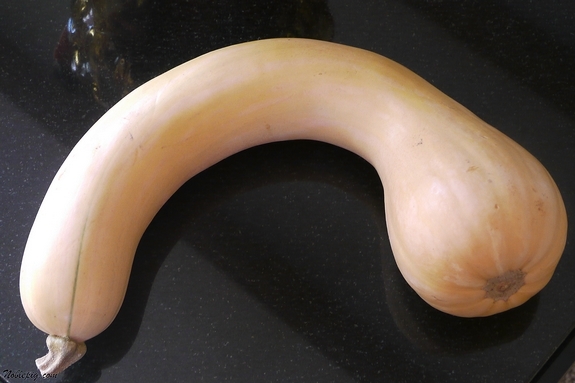 That butternut is hilarious, crazy shape. Your weekends are good, I cleaned bathrooms. Pffttt. What a veritable feast for the eyes! Every picture was wonderful and the table looked lovely. Loved/hated the spiders, LOL! Love the atrium. 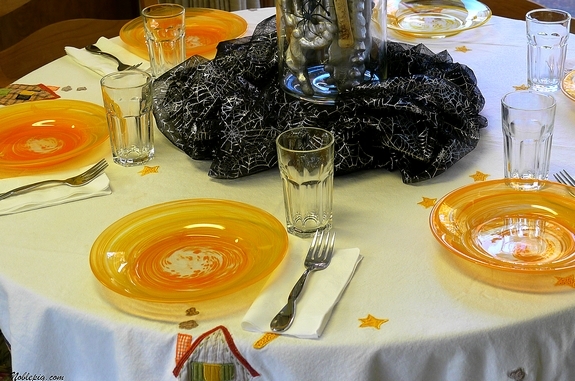 And the Halloween tables. 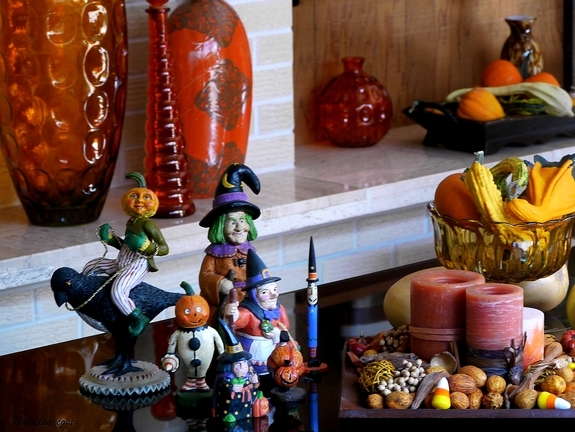 Halloween is so much fun to decorate for. Those trees are beautiful! I wouldn’t know a Ginko tree if it jumped out in front of me. Before I stopped in I was thinking “Cathy hasn’t posted much Halloween yet…and I know its her favorite holiday!” Well surprise to me! This pasta dish looks absolutely scrumptious. I am definitely making it SOON as I am a huge lover of brie cheese. Mouthwatering photos! P.S. My son Christopher manages the Dominos in our town! I love how you decorate for Halloween. Your tables look so great for your dinner party. I thought of you on Sunday as we drove through McMinnville on our way home from camping in Pacific City. Nice photos. Cool table spiders! I so wanted to enjoy the nice weather on Saturday but have been sick for over a week. I think all my son has been eating during that time is pizza. 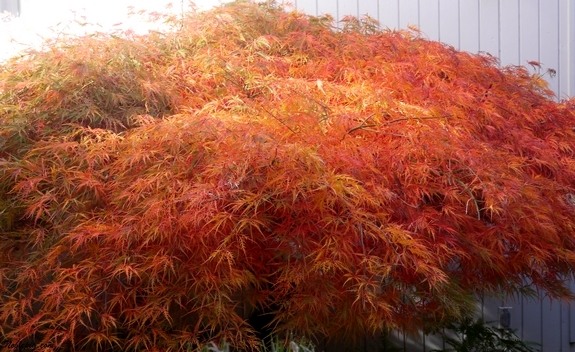 That’s a gorgeous Japanese maple! And, your party must have been great fun. Looks like fun times at the home of Noble Pig! All the best Cathy! Cathy, yowser, your energy must be endless, though your photos make it seem effortless. Here’s to the hardest working woman in the Wilamette. Good luck on the winter cover crop — you’ll have gorgeous green fields in no time. I was wondering when we would see all of your favorite decorations! I LOVE your atrium! I had remembered that this was one of your favorite holidays and knew you would come through with some fun photos. I am incredibly late to the party! Our weekend was interesting. I took too many pics, most of which I haven’t even started post-processing. Meh…just not feeling it. Love your scenery! It’s just gorgeous. And can I just say that your tablescapes are amazing! 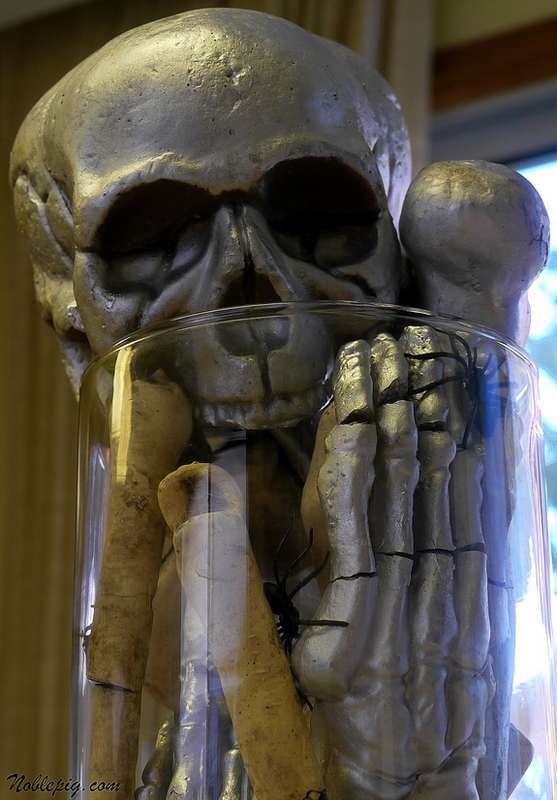 Love the skull and bones in the hurricane vase! I can’t remember my weekend too well, so it must have been a little on the quiet side. 16 people for dinner!?! I’m tired just thinking about that!! The tree is so beautiful and I love all your decorations! Your weekend looks like so much fun – all except having that many people for dinner! How in the world do you do it? Lots of specialists state that credit loans aid a lot of people to live their own way, just because they can feel free to buy needed things. Moreover, banks give financial loan for different classes of people.